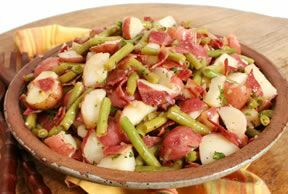 The green beans and bacon give a boost of flavor to this potato salad recipe. 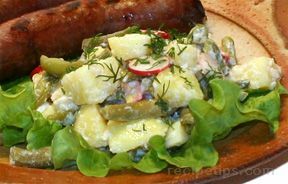 Without the addition of mayonnaise and the use of turkey bacon rather than regular bacon, this potato salad recipe has fewer calories and less fat added for a healthier option. 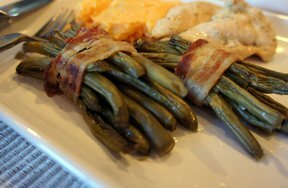 Cut turkey bacon into bite size pieces and fry in a large skillet until crisp. Remove turkey bacon from skillet and place on paper towel to remove any excess fat. Slice potatoes (unpeeled) into bite size pieces and cook in boiling water until just tender, approximately 15 minutes. While potatoes are boiling, stem beans and cook for 8 minutes or until just tender and slightly crisp. While the beans are cooking, combine the dressing ingredients and whisk together. Drain potatoes and beans and then place potatoes, beans, and bacon into a serving bowl. Pour dressing on top and toss.